Plane Spotting: Who’s Flying the A380? Do you ever make it a point to do a bit of plane spotting when you’re at the airport? Most frequent flyers have a healthy respect for the aviation industry and are intrigued by the newest and most technologically advanced aircraft. If you’ve watched the tarmac at some of the world’s largest airports, you’ve probably been astounded by the mammoth Airbus A380. With a wingspan of about 262 feet, a length of nearly 239 feet and a height of 80 feet, this is one massive aircraft! In fact, this double-deck, wide-body four-engine jet airliner is the world’s largest passenger airliner. It is so much larger and heavier than other aircraft that only airports that have upgraded their runways can accommodate the A380. Airbus says that airlines generally configure the A380 with three classes: first (usually 10 seats), business (76 seats), and economy (439 seats), making the total capacity 525. However, the aircraft can accommodate up to 853 people when outfitted with all economy seating. Two staircases forward connect the two decks of this aircraft. In addition to being incredibly large airplanes, A380s have an impressive range, with the ability to fly 9,800 miles. This has opened up several long-haul flights. Emirates flies the longest A380 flight from Dubai to Los Angeles. Its an 8,339-mile trip that takes 16 hours and 20 minutes. In September, Qantas will bump this flight out of the record books with its own Sydney to Dallas-Fort Worth trip, which will become the longest A380 flight, as well as the longest commercial flight in the world. Flying an A380 is an aspiration of many frequent flyers. Why? The A380 is not only a state-of-the-art aircraft, it flies to some of the most fascinating destinations on Earth, and many of the aircraft are outfitted with suites and first-class cabins that put five-star hotels to shame. Here’s a snapshot of the airlines currently (or soon) flying the A380, their routes and the cabin classes offered. Routes: From Paris to Los Angeles; New York; Washington, D.C.; Johannesburg; Tokyo; Shanghai; and Singapore. Cabins: Four cabins accommodating 516 passengers, including nine La Premi¨re/First seats and Economy seating on the main deck and Business, Premium Economy and Economy on the upper deck. Routes: From London to Hong Kong, Johannesburg and Los Angeles. Cabins: Four classes of cabins, with First, Club World, World Traveller Plus and World Traveller, accommodating a total of 469 people. Routes: From Beijing to Guangzhou, as well as Guangzhou to Los Angeles, Shanghai and Sydney. Cabins: Three classes of service, with 70 flat-bed seats in First Class and 76 Economy seats on the upper deck. 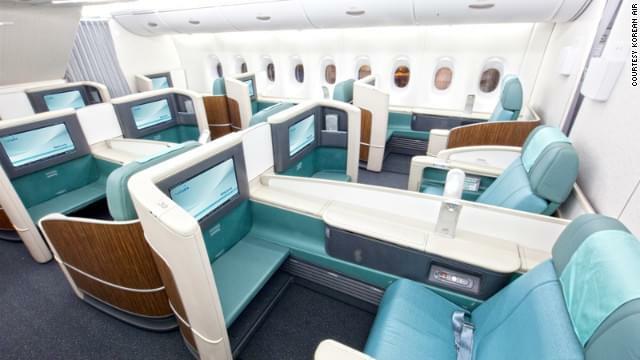 The main cabin is outfitted with eight Platinum Private Suites (also with flat-bed seats) and 352 Economy seats, for a total passenger count of 506. Routes: From Dubai to Amsterdam, Bangkok, Beijing, Jeddah, Bangkok, Hong Kong, Johannesburg, Kuala Lumpur, London, Los Angeles, Manchester, Melbourne, Moscow, Munich, New York, Paris, Rome, Seoul, Shanghai, Singapore, Sydney, Tokyo, Toronto and Zurich. You can also fly from Bangkok to Hong Kong, Melbourne to Auckland, and Sydney to Auckland. Cabins: Emirates has two versions of the A380. The first has 14 First Class Suites, 76 Business seats, and 399 Economy seats. The second version has an increased number of Economy seats 407 aboard. Routes: Starting in December 2014, from Abu Dhabi to London. 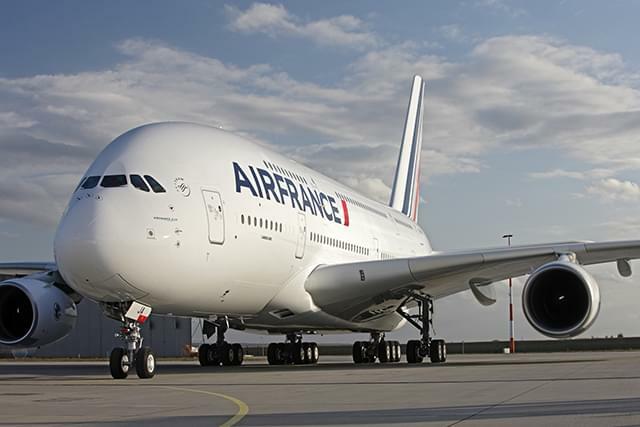 The airline also has plans to put A380s into service from Abu Dhabi to New York and Sydney. Cabins: There will be two Residences, nine First Class seats, 70 Business, and 417 Economy, for a total of 498 passengers. Routes: From Seoul to Atlanta, Frankfurt, Hong Kong, Los Angeles and New York. Cabins: Three-class configuration, with 12 First Class Kosmo Suites, 94 Prestige Sleeper Seats (Business) and 201 Economy. Routes: From Frankfurt to Beijing, Houston, Johannesburg, New York, San Francisco, Shanghai, Singapore and Tokyo. Cabins: Three-class configuration of First (eight seats), Business (98) and Economy (420). Routes: From Kuala Lumpur to Hong Kong, London and Paris. Cabins: Three-class configuration of First (eight seats), Business (66) and Economy (420). Routes: From Melbourne to Los Angeles and Dubai; Sydney to Hong Kong, Los Angeles and Dubai; and Dubai to London. Cabins: Four cabins: First Suites (14), Business (64), Premium Economy (35) and Economy (371). 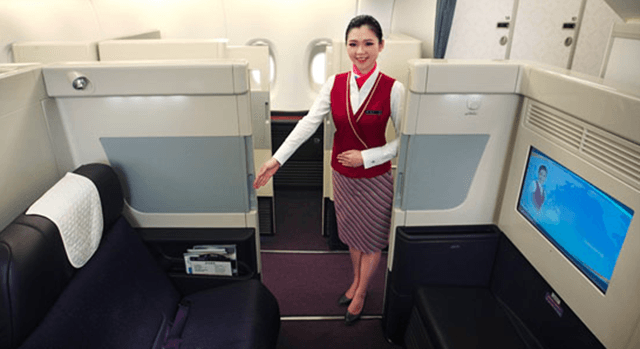 Routes: From Singapore to London, Paris, Frankfurt, Hong Kong, Tokyo, Melbourne, Sydney and Zurich; San Francisco to Hong Kong; New York to Frankfurt.Cabins: 12 First Class Suites popular with frequent flyers; 60 Business seats; and 399 Economy seats. Routes: From Bangkok to Frankfurt, Hong Kong, Paris and Tokyo. 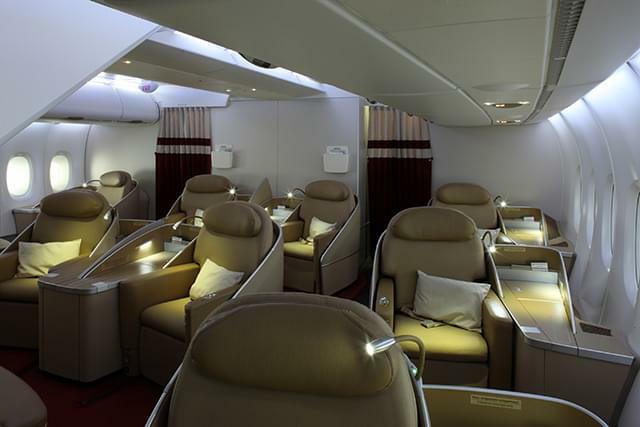 Cabins: 12 Royal First Class seats, 60 Royal Silk Class (Business) and 435 Economy seats.